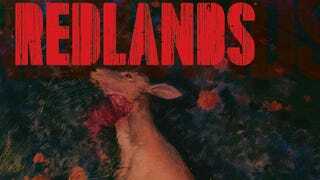 The first issue of Image Comics’ Redlands hits like a battering ram. Telling the story of a coven of witches who seize control of a small Florida down from a corrupt police force, the first chapter jumps straight into the action, depicting a horrific, unrelenting series of events that set a vicious tone for the miniseries. Writer and colorist Jordie Bellaire, artist Vanesa Del Rey, and letterer Clayton Cowles waste no time jumping right into the intensity, but for the book’s second issue, they’re slowing things down and giving readers the chance to catch their breath before the next terrifying twist. 30 years after the events of the first issue, witches Alice, Bridget, and Ro are the new Redlands police department, but they have their work cut out for them in this exclusive preview of issue #2. “When we were first cracking the lettering style, I used the same pre-made tails you would see in Batman or The Vision or anywhere else,” says Cowles. “We decided to go with those tails, but after looking at the samples the next day with fresh eyes, I thought hand-drawn tails would suit Vanesa’s artwork better. Her linework is hazy and atmospheric, and the stiff tails cut right through its natural grace, so I made the change. Plus, with Redlands being a creator-owned book, there comes the freedom to experiment, especially when your collaborators are as innovative and open-minded as Jordie and Vanesa are.” This is a creative team that really understands the potential of the medium, and readers can see their craft in action by picking up the first issue of Redlands right now before grabbing #2 on September 13.